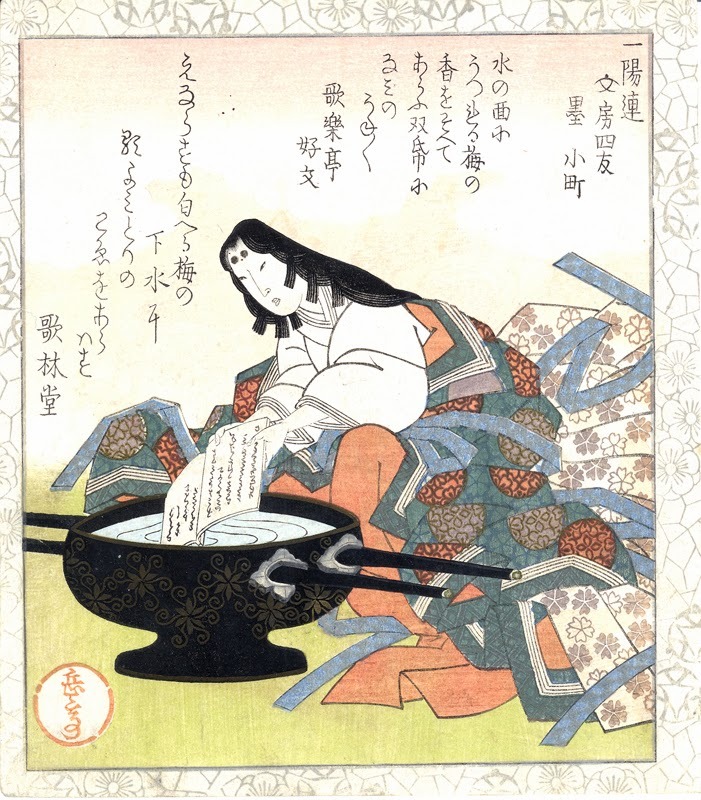 Surimono, meaning "printed thing," are a subsection of traditional Japanese woodblock prints. They were printed on commission in small numbers and generally not sold by art publishers, unlike their more commercialized companions, ukiyo-e woodblock prints. Known as far back as the early 18th century, surimono rapidly rose in popularity in the 19th century. 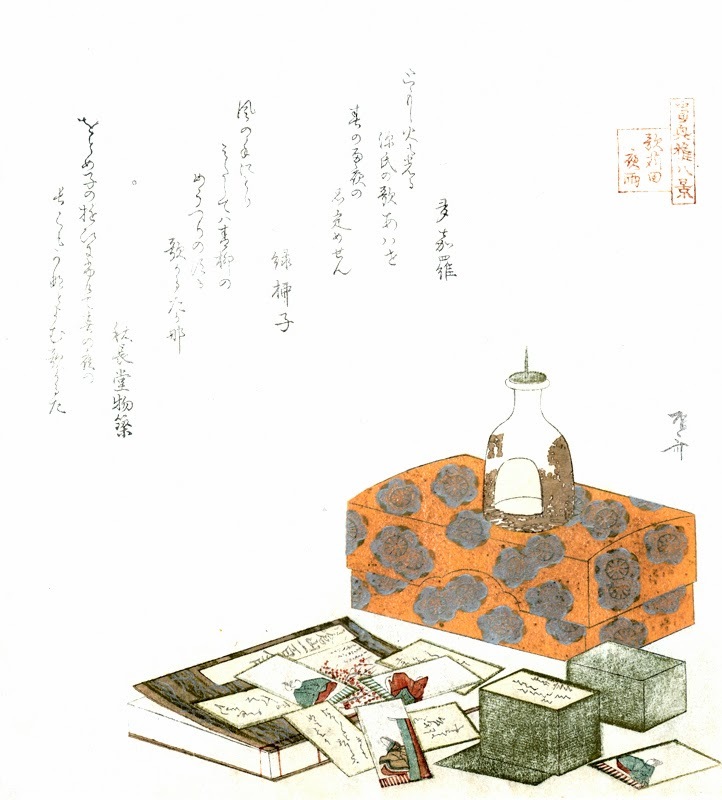 They were printed on high-quality paper, called hôsho-gami, using the finest printing techniques. Prior to 1810, these sheets could be quite large and folded so that the illustration accompanying the text faced outward. Later into the 19th century, however, sizing of surimono became more standardized and most were printed on small, nearly square sheets called shikishiban. Most surimono consist of poetry surrounded by images. They were often distributed among members of a literary club, called ren, which practiced the art of writing poetry, generally under the instruction of a known master. Many surimono were also commissioned as New Year's greetings or to commemorate special occasions. 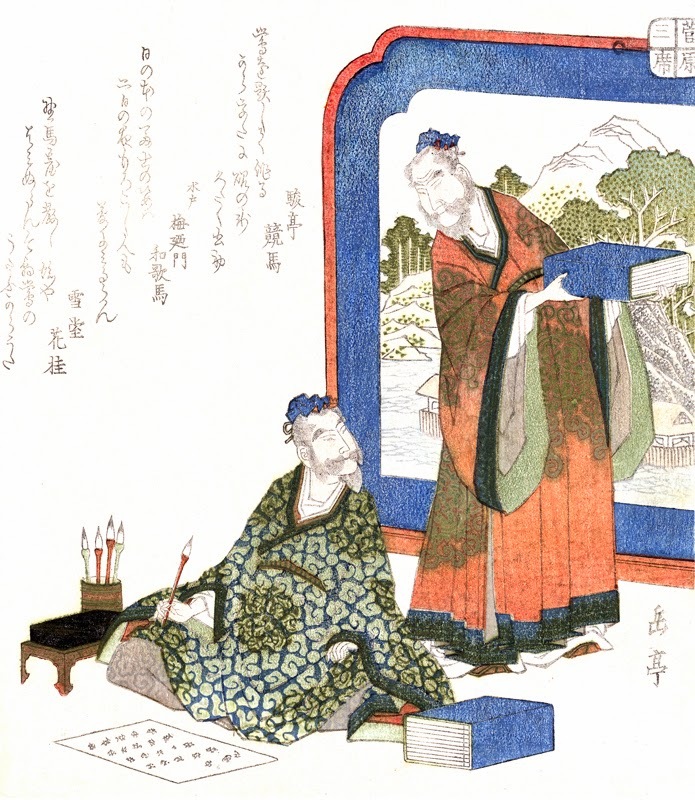 For contemporary admirers of surimono, the poetry is of secondary importance, as its meaning would only be known among the members of the poet's circle. It is the illustrations, often heightened with mica, silver, and embossing, that bring such beauty to these small prints. The coming of spring was often represented with plum blossoms and other flowering trees and brilliant colors. The imagery often depicts animals of the zodiac, beautiful women, flowering trees, or still lifes. Books and scrolls are sometimes included, but are not common. 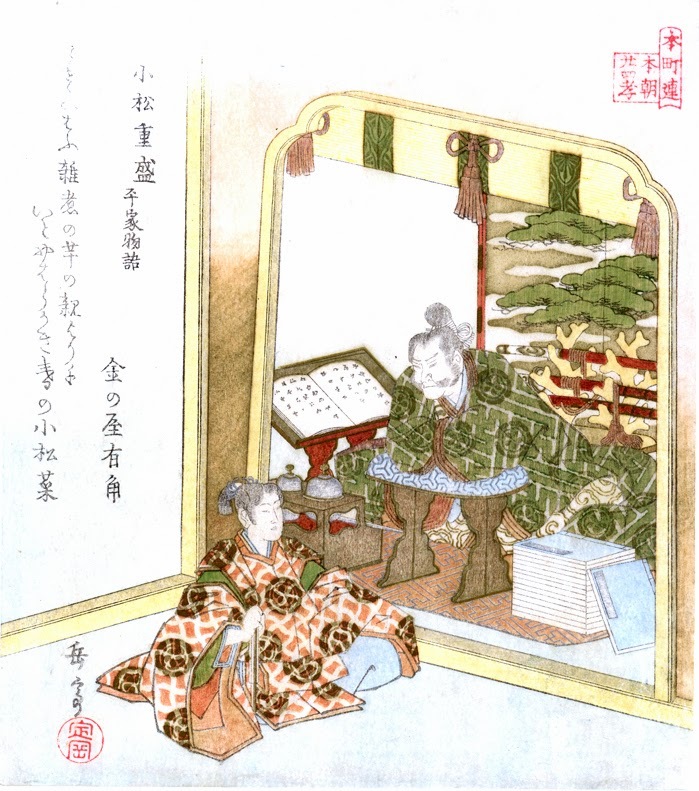 The collection illustrated here contains sixteen surimono depicting scenes that include books and scrolls, dating mostly from the early part of the 19th century. This collection was gathered over twenty years and, to our knowledge, is unique in its focus on images of a literary nature. 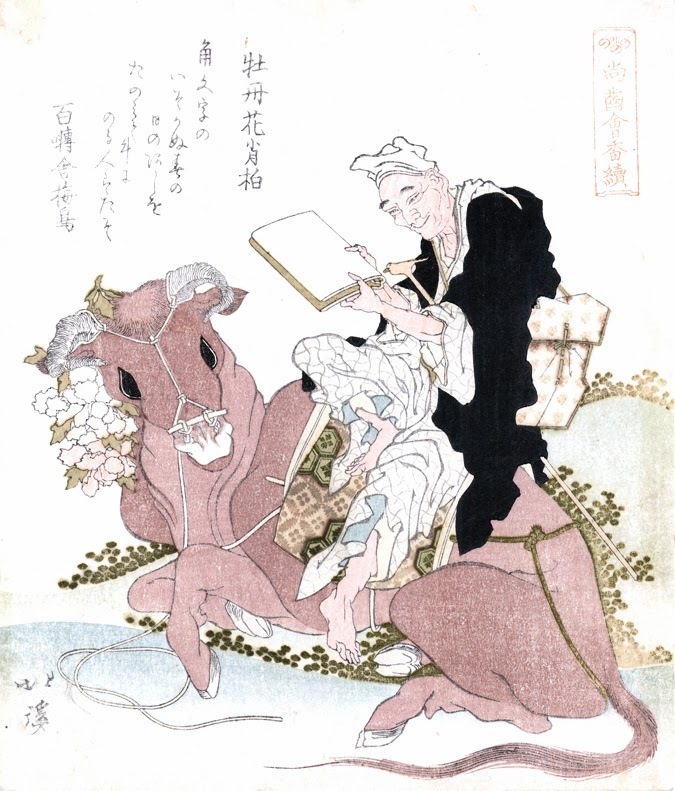 The artists included are Yashima Gakutei (1786-1868), Toyota Hokkei (1780-1858), Utagawa Kunisada (1786-1865), Yanagawa Shigenobu II (1787-1832), Ryuryukyo Shinsai (1764-1820), and Suga Shoho (1790-1852). The artists of two of the surimono are anonymous. 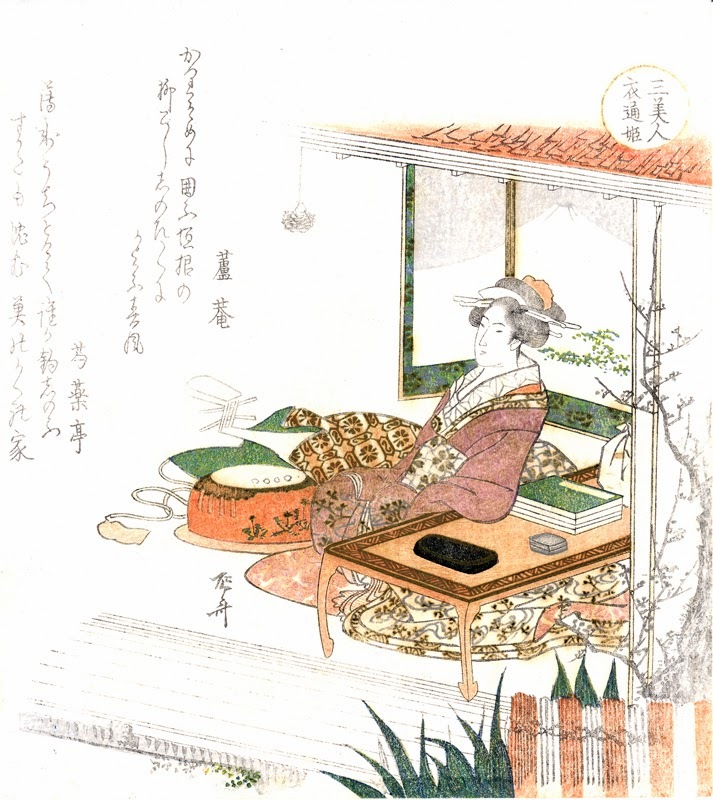 One illustration by Yanagawa Shigenobu II, the pupil, and later son-in-law, of the master Hokusai, depicts a courtesan tuning a samisen while sitting in front of a book of poetry. 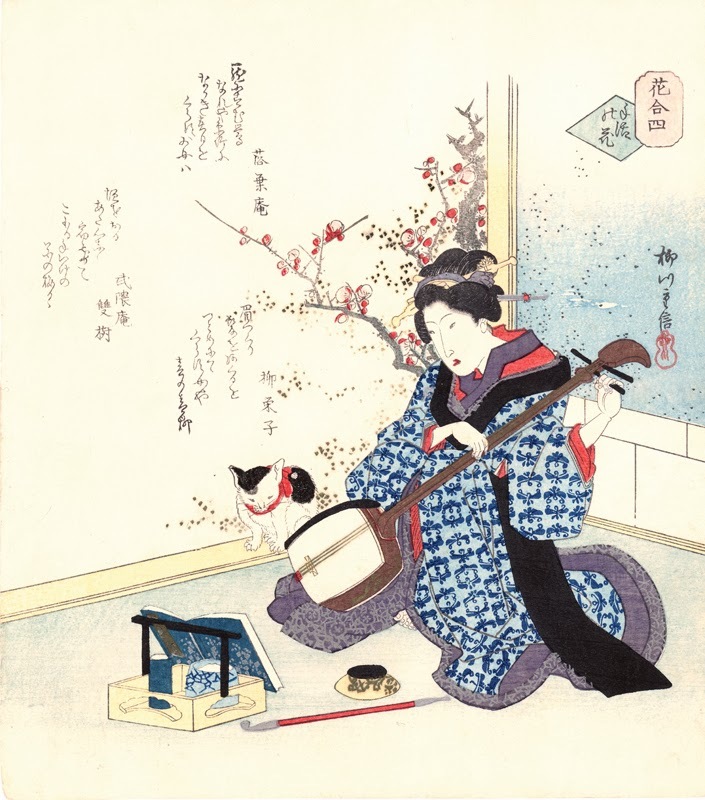 A cat sits by her side, and cherry blossoms are behind her. 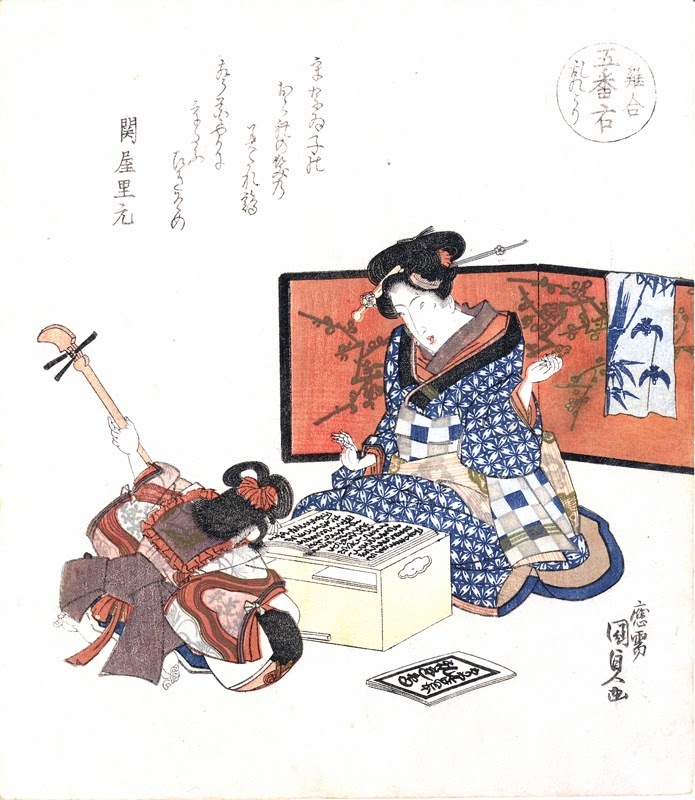 Patterns on the hem of her kimono, her hair ornaments, and her calligraphy brush are heightened with metallic silver ink, and her instrument and inkwell have decoration in gold. 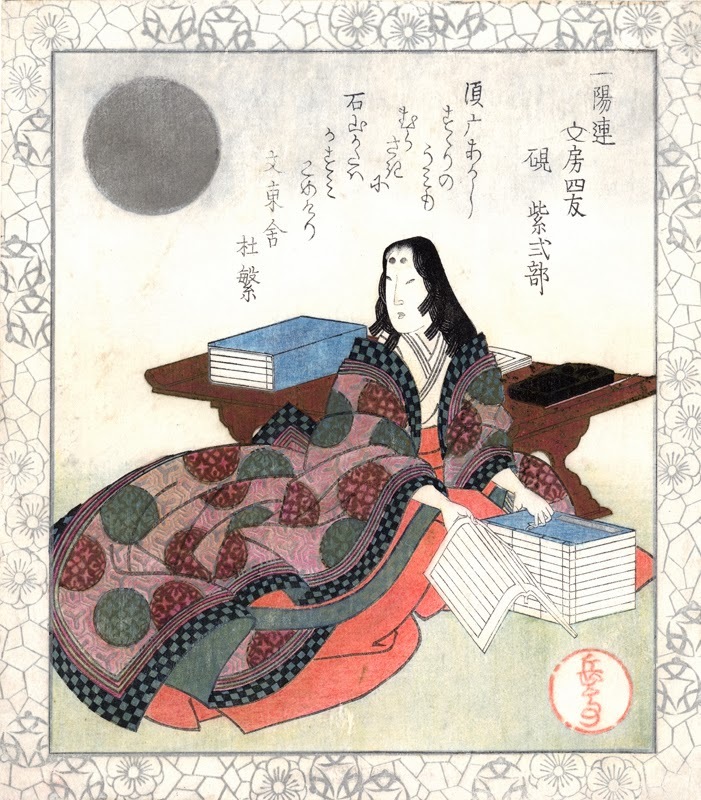 In another surimono by Yashima Gakutei, perhaps the most prolific of all surimono artists, the poetess Murasaki Shikibu sits next to her writing desk among stacks of books. The border around the image and the moon overhead are printed in silver, and her colorful kimono is partially patterned in silver. 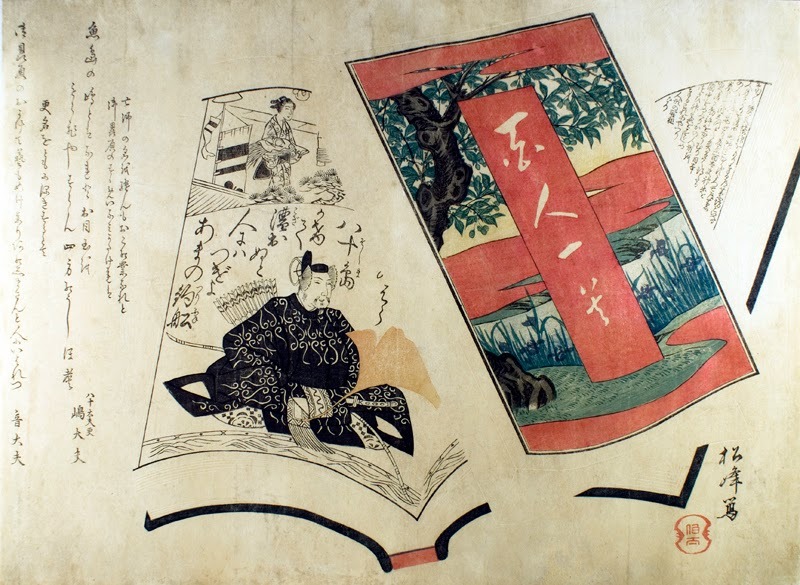 The largest surimono in the collection depicts pages from a famous illustrated book, Hykanunin isshu, a collection of one hundred poems by one hundred famous poets. Other surimono in the collection depict still lifes with books and writing instruments, and poets accompanied by animals of the zodiac. The prints range in size from 5 1/4 by 7 1/4 inches to the longest, in a panorama format, measuring 22 1/2 by 8 1/2 inches. Visit our website to learn more about this collection of surimono. 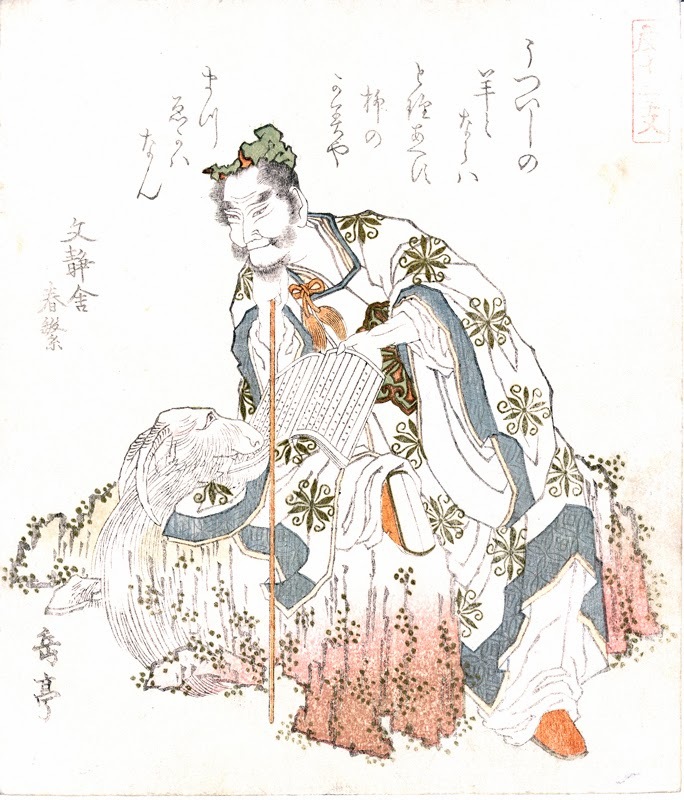 The Museum of Fine Arts, Boston owns a large collection of surimono, many of which are digitized on their website. To delve deeper into the history of surimono, go here. As always, thank you for reading. © Bromer Booksellers. Watermark theme. Theme images by sndr. Powered by Blogger.